about Stars for our Troops. Listen to his song on YouTube here. Please do not send printed flags or large Flags. Flags must be made in the USA. Please write on front of package the number of embroidered flags enclosed. Flags with Stars larger than 2 inches across should be donated to your local national cemetery or veteran organization. To ensure a return response, please make sure your e-mail address, full name and city and state is included in all correspondence. Phone calls messages also need full information as to the reason for the call, your name and organizations name. 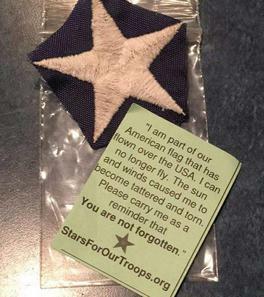 We are a group of volunteers that are patriotic, who take old tattered and faded US Flags, retired from service and we pass the legacy of their embroidered Stars to those that defended them. 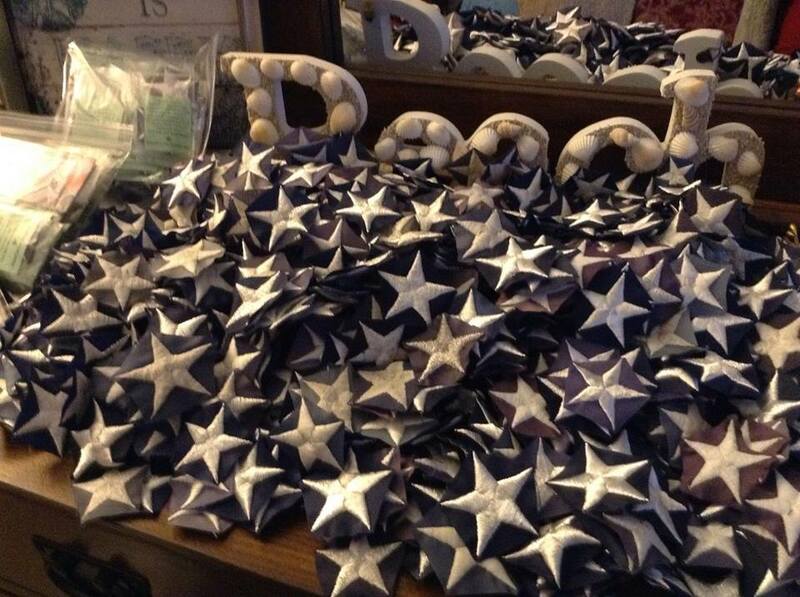 The best embroidered stars for this project are from 3 ft x 5 ft American made flags. 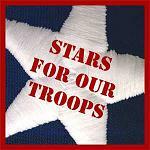 Stars for our Troops Inc. Stars for our Troops Inc.
Any PayPal entry that does not match a name and e-address from any form on this website will be considered a donation. The mailing of Stars to anyone is at the discretion of Stars for our Troops Inc.
Look at the updated Map of the USA to find a Star Maker near you. They have Stars and will take your 3'x5' flags with embroidered Stars. Dec 31, 2018 and the count is 125,000+ Stars from over 2700 flags. Thank you for the flags that are still arriving every day. This does not include the thousands of Stars that are created and shared by Star Makers and Organizations across our United States. Troops. They have supported us with cantons from retired flags since 2010.